There are many services that don't work outside the United States, the great majority due to copyright, furthermore, we may also want to have an American IP for some other reason, which we can now obtain thanks to MicroVPN. This program is developed by a company that has several servers in the United States, and basically offers the connection to a VPN (Virtual Private Network) by means of which all the users connected will exit the VPN through their servers. This means that even if you are connected in your own country, your connection will indicate that your are in the USA. 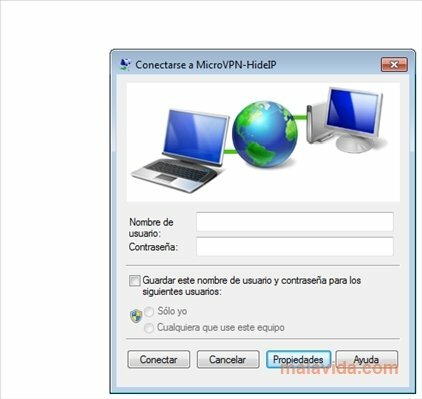 To offer this service, MicroVPN offers you several American IPs, protection by means of 168-bit L2TP/IPsec encryption, and various other protection elements that together with the ease with which the software connects and how easy it is to configure, make MicroVPN one of the programs that changes our IP in the easiest way. Furthermore, it's compatible with any software that uses the Internet, like the most popular browsers and instant messaging clients.